Cuneiform has collaborated with two members of the Bone trio - guitarist Nick Didkovsky and drummer John Roulat - to release a benefit CD to help the family of Bone's third member: bassist Hugh Hopper, who died of leukemia in 2009. 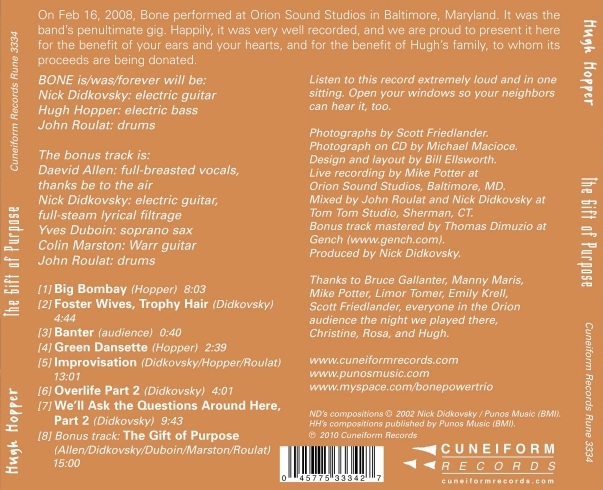 The CD is called *The Gift of Purpose*, and features a live concert that Bone performed at Baltimore's Orion Sound Studios on Feb. 16, 2008, during Hopper's last tour of the States. There is also a bonus by Didkovsky, Roulat, Colin Marston (Behold....the Arctopus, Dysrhythmia, Krallice), Yves Duboin (Doctor Nerve), and Daevid Allen (Gong, Soft Machine, etc). The manufacturing costs for The Gift of Purpose were donated by Didkovsky, Roulat, and Cuneiform's Steve Feigenbaum; Bill Ellsworth donated his graphic layout services. 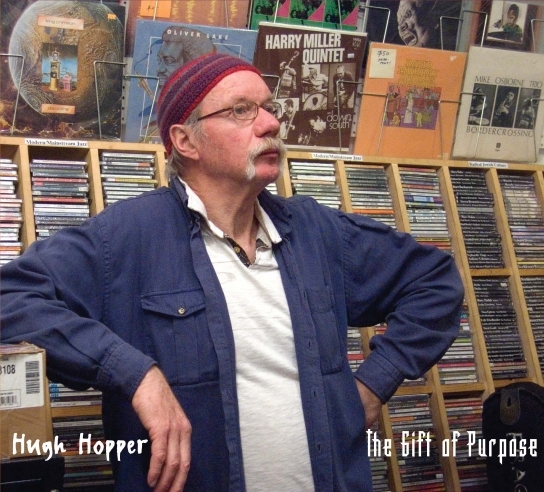 The Gift of Purpose will be released as a limited edition and 100% of all proceeds from its sale will go directly to Hugh's widow, Christine Hopper. Because this is a benefit album, promo copies are not available. The CD is available for sale now- at Wayside Music www.waysidemusic.com and at Downtown Music Gallery www.downtownmusicgallery.com. We encourage everyone to help the Hopper family by purchasing a copy of the CD - "we get by with a little help from our friends." Hugh remains alive in the hearts of all who have known him. And his performances are captured for eternity on recordings worldwide. We encourage our friends in press and radio to keep his musical legacy alive so that new generations will discover his splendid tunes, his inventive electronics, and his unique, irreplaceable and forever memorable sound on the bass.